AccuBurn, Inc’s flame, laser, and plasma cutting services have met the needs of leading manufacturers for over a decade. Our extensive array of production equipment, uncompromising commitment to quality, and world-class customer service set the standard in our industry. We are proud to have earned the long term relationships with our customers that form the foundation of our success. 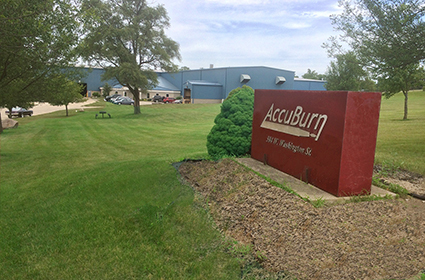 With 50k square feet of production facilities, AccuBurn is continually adopting new technologies with a single goal in mind to ensure we are always meeting the evolving needs of our customers by producing parts of the highest quality. AccuBurn’s 10k square foot laser production facility was specifically designed to maximize the effectiveness of our new Mitsubishi LVP Plus 40-CFX series lasers. With cutting capabilities up to .625” on mild steel and cutting speeds that surpass the competition, we can accurately process a large amount of material in a very short period. With three lasers and the capability to add an additional three, we can better react and expand to meet customer needs in a short period of time.